India Yamaha Motor has added new colour models to its existing range of stylish scooter ‘Fascino’. 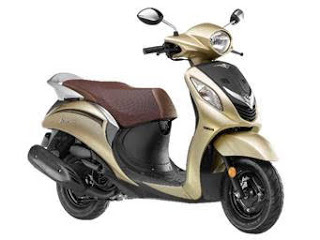 From today Fascino Scooter will be available in new color range of Glamorous Gold, Dapper Blue, Beaming Blue, Dazzling Grey, Sizzling Cyan, Spotlight White, Sassy Cyan at ex-showroom price of Rs. 54,593. According to the company, the new colour models continue to offer an air-cooled, 4-stroke, 113 cc, “BLUE CORE” engine with a continuous variable transmission (CVT) that offers great fuel efficiency at 66 km/L (under standard test conditions). The new Fascino also has features such as new body styling with dynamic curves embellished with chrome-plating placed on the front fascia along with a new Fascino emblem, a BLUE CORE engine with high combustion efficiency to offer among the best fuel efficiency in the class, weight of only 103 kg that contributes to both fuel efficiency and ease of handling, stylish new graphics on the front and the sides of the external body and dual tone seat-covers with a raise grab-bars.